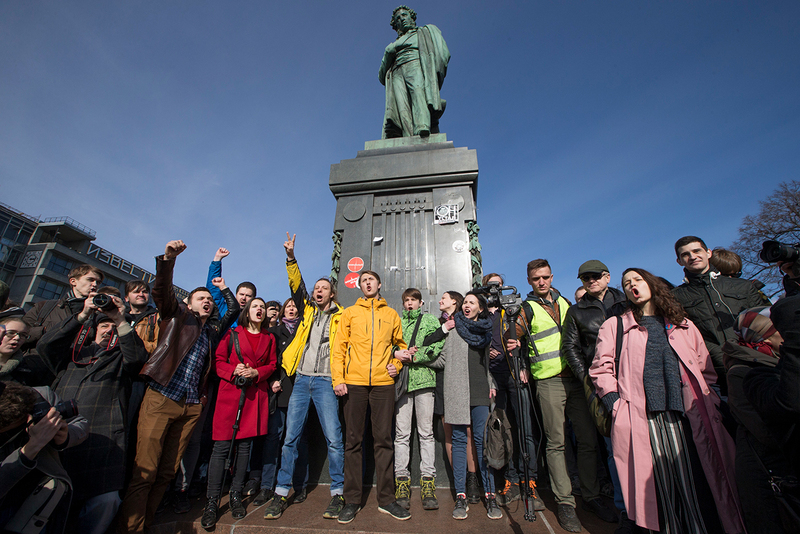 People surround Alexander Pushkin monument in downtown Moscow. On March 26, protests against corruption were held across Russia. The Levada Center carried out a survey about public perception of corruption. Russians are less likely to blame President Vladimir Putin, but more likely to complain about universal corruption. Researchers from the Levada Center asked Russians about corruption, and 89 percent of respondents think corruption should not be tolerated in state bodies and institutions. Even more revealing, a vast majority believes that government bodies are in fact totally or seriously corrupt, and that both sides - those who give and those who take bribes - are equally responsible. Overall, however, there's been little change in Russians' general attitude toward corruption over the past few years. "We've observed that the number of those who believe the country's leaders are corrupt from top to bottom has grown, albeit by not much. Also, highly-public anti-corruption campaigns against regional governors, where all national TV channels show bundles of illicit cash, in the end only reinforce the belief that everything is rotten in the government and no real fight against corruption is under way," said Levada expert, Denis Volkov. In focus groups, people still remember a major corruption scandal in 2012 that led to the resignation of Defense Minister Anatoly Serdyukov. "At first, the case was widely presented in the media as just retribution against a corrupt official, but then officials let him go free, and the public was very upset," Volkov recalled, adding that Serdyukov’s release provoked an extremely negative reaction, with 70 percent of people against it. On the other hand, President Putin in recent years has been held less and less responsible for the situation in the country, said pollsters. If in 2013-2014 almost 40 percent said the president was fully responsible for what was happening, in the past two years these people accounted for 25-26 percent. "Most likely this is a result of an improvement in the authorities' legitimacy after Crimea joined Russia, although it would seem there’s no direct link with corruption here," said Volkov. "But we observed that by the end of 2014, and during all of 2015, the authority of not only Putin, but of all state bodies, began to grow." In your opinion, to what extent are state bodies in Russia corrupt?